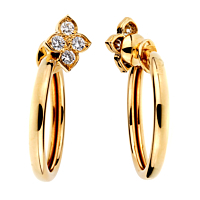 A chic pair of Cartier hoop earrings featuring a flower motif, set with 8 round brilliant cut diamonds in 18k yellow gold. The hoops on this pair of Cartier hoop earrings are .11 wide and 1" in circumference, and the total diamond weight is 0.40 carat. The design of these lovely Cartier diamond gold hoop earrings inspires playfulness and spirit in both the wearer and observer.